Long arm quilting machines are for experienced quilters or advanced level hobbyist. If you are thinking why am I mentioning this here? Well, as these machines will be of use to beginners too but spending 7000-10,000 for a long arm quilting machine just to hone and practice your skill is not a wise idea. If you are a beginner, try to perfect your skills on a home sewing machine or sit-down quilting machine. We have recently published a detailed article on sit-down quilting machine, click here to read. In this article, we have entailed not only what quilting machines are best but also; how to smart shop for these based on your needs. Here you'll find machines that are suitable for home beginners and experienced sewists. Juki TL-2000qi has proved itself as a Darkhorse. It will shine through that aluminum die-cast frame. Let’s dwell on some of the exciting features of this machine. Juki’s TL-2000qi can run at the speed of 1500 stitched per minute. The aluminum frame keeps the machine from causing unnecessary vibrations. Industrial built that means it can easily perform on layers and heavy-duty fabric. Excellent for quilting large sized quilts. Comes with all the necessary features such as knee lever, drop feed dogs and automatic needle threader and more. It's a durable and sturdy machine. Heel tap thread cutter is another big plus, but it will get some getting used to it to avoid accidental thread trims. It is great for free motion quilting. Automatic needle threader can sometimes be difficult to use. Not to forget this machine is a multi-purpose machine and it is built to accommodate many kinds of projects. Juki’s TL2000qi is a dark horse that can easily be tamed by beginners. This machine is a delight for home quilters and sewists as it is all-in-one easy to use machine. 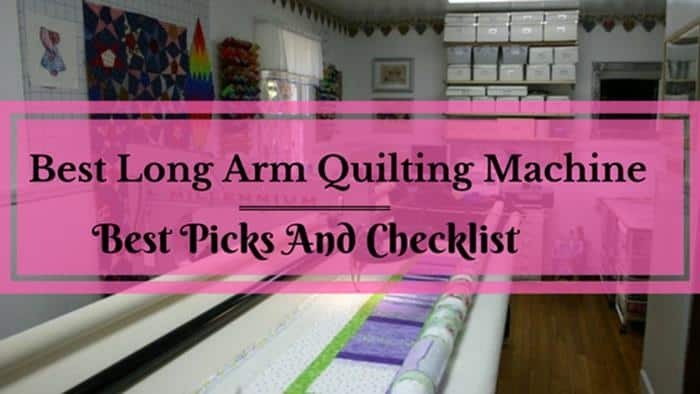 It's one of the best long arm quilting machine for beginners. Brother’s PQ1500SL is highly recommended home quilting and sewing machine. Possessing the qualities of a high-end industrial, quilting and sewing machine is a tech-savvy machine. It's one of the most affordable long arm quilting machines in the market. Automatic needle Positioner: It's a boon for quilters and finding such a feature in home based long arm quilting and sewing machine is rare. Knee lever: Knee lever is placed for lifting the presser foot. It’s always a delight to keep your hands free while working on a sewing project as hands are anyways consumed in positioning fabric. Heavyweight: This home quilting and sewing machine is quite heavy, that means even stitches and durable machine. Heavyweight machines can manage heavy-duty work efficiently. Feed dog: You can control and adjust the speed of feed dog with your foot pressure. As well, it comes with a retractable drop feed dogs and has four settings for handling different types of fabrics. Sewing Space: Many quilters look for wide sewing space; it comes with 5.7x 8.6" sewing space. Additionally, you can also use the wide 12x18" extension table to work on even larger projects. Speed: The speed of this machine is 1,500 Stitch per minute. Threading instructions are not as clear as they should. A few people took time to get used to threading and adjusting tension, but once they get the hang of it, they loved it. Other than that, there are no such significant cons found. This brother long arm quilting machine is convenient for your home. You can quilt, sew, create and play to explore your craft on this machine easily. It’s selling line should read – Easy to sew and easy to maintain. It is a conventional machine with good speed, useful features and it is great for hobbyists who can also use this machine for different projects. 1500 Stitches per Minute: This is one of the excellent features for advanced quilters, who want to race through the quilting projects. LED Light: Quilting hobbyists are going to love this as they want a clean and lighted place to work upon. Knee lever is always helpful. Table extension: Juki has included table extension (12x23") for quilting, you can attach or remove this table according to your sewing requirements. Heavy fabrics: You can layer up and use it for upholstery, Home décor and even for leather and Canvas Projects. Once again auto needle threader is a culprit in this Juki machine, it's not easy to use. However, if you are a seasonal quilter then this quilting/sewing machine is best for you. If you are a serious seamstress and a quilter, then this machine will not disappoint you. It is one of the advanced quilting/sewing machines. Grace Q’nique can boast itself as a fully automatic machine. It is a modern machine with old key features. It has a unique interface, with monitor to keep an eye on your design. Regulation of Stitches – Yes! It does have regulation of stitches, to keep stitches consistent and perfect. Bobbin – Comes with a large M shaped bobbin. Grip handles to maneuver machine. Speed – It can sew up to 1800 stitches per minute. OLED Screen – It displays navigation menu. Grace Q’nique have four sewing modes. Precise stitching mode allows quilters to set the stitching rule as per their stitch per inch need for consistent stitches. This mode will stop stitching when you stop the movement of the machine. It's handy for experienced sewists. In this mode, stitch regulator adjusts the speed according to your need. The second mode is called as “Cruise Stitch Mode.” In this mode, you can set the minimum stitch speed as well as the stitch per inch. When you increase your speed, it doesn’t hinder your stitch quality but if you slowdowns or stops, it maintains the set minimum stitch speed. Baste stitching mode: Basting is essential in securing the edges of a quilt. You can use any stitch size for basting, long, medium or short. Manual stitching mode: as the name says it all, if you want to run the machine free-style. You can control the speed with the buttons on the handles. These are high-rated pros of this machine including other key features such as electronic display, encoders, etc. Grace’s Q’nique is an excellent workhorse quilting machine. Also, it’s quite cheap considering the options it comes with. It can be overwhelming for the beginners due to its share number of features. It is a large machine fit for industrial or professional needs, so, if you are looking for something this huge then go for it. It is a perfect machine. This article is penned understanding the different audience, if you are a home-based long-arm quilter, then Juki TL-2000Qi is an amazing sewing and quilting machine. However, if you are an advanced quilter, then you can opt for Juki TL-2010 Q. It is a dream machine for home based advanced users. You can quilt, sew, undertake upholstery projects and play with it as much as you can. For professional use, Grace Q’nique is an ideal machine on the market. It is sturdy and reliable machine to use. You can quilt as much as you want at the lowest maintenance cost. All in all, you need to understand the categories of the quilting machines. The difference between the long arm and mid-arm quilting machines is mainly the sizing of the throat. The domestic or short arm is anything between a 3” to 13”. It is the 9”-13” size that is best for short arm quilters. Mid-arm machines vary in size from 13”-16” Machines. Whereas, Long-arms are 16”-26” machines. These generalizations presented here is to make you understand your ability and what you want to go for. Wondering; What to look for when buying a long arm machine? Here is the checklist for you. Too many features can be overwhelming and can spoil the usability. Look for machines that are easy to operate. Look for a quilting machine that you can upgrade easily. As skills advance so does the hunger for complicated designs grow. Some long arms can be updated, and some don't make sure you get the upgradable machine. These machines are quite expensive. Therefore, it is recommended that you try and work on potential options. You'll get the feel of the machines without investing. Computerized long arm quilting machines are ruling the quilting machine industry currently. If you are not a conventional quilter and want to try out some technically Hi-fi machines, then these machines can be boon for you. These are modern versions, and the sellers of these machines allow users to visit their stores so that they can try. They also run workshops to explain various advanced features. These machines are advanced and come with so many features. So, checking them out will only be fruitful. These days quilting machines come with many advanced features, and they are fun to use. Quilting stitches are most important. Fun factor is critical to look for. Otherwise, you'll be having a hard time using it for the long run. You can also inquire about the machine parts and its approximate costs. For example cost of bobbin, needles, oils and regular products that will be used frequently. Analysing costs will help you in planning your budget easily. Understanding technical know-how will save you a lot of time in the future. There are three types of these machines, sit-down, mid-arm and long-arm. It is vital for a buyer to understand all these three and differentiate their distinct qualities and features. It will give you a clean head while purchasing your device. Understanding the maintenance requirement of the machine will be beneficial. Are the machine parts available easily? How to repair broken needles, jammed machine and so on. Yes! Many long arms come with a lifetime warranty. So, always ask for the warranty period. Here is the article about the best sit down quilting machines. Read about mid arm sewing machines here.